Wahl, Ah’ll be doggoned! Looks laik you’n me’re jest ’bout at the Westerns! God knows how those writers kept up that slack jawed drawl for over 500 pages (probably because they didn’t have to write it all in one sitting, like you might read it.) I’ll probably be getting pretty used to it though, because the next section of the DC Universe Reading Order is firmly set in the old west. 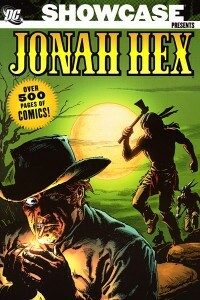 Tonight’s book is the 528 page Black and White Showcase Presents: Jonah Hex. The last 100 pages or so are reprints of stories from early issues of All Star Western, starring a couple different outlaws. There’s no El Diablo here, even though he was often in these same pages. Perhaps they’re planning another book for him somewhere down the line. Bat Lash, one of the others from these books, already has his own showcase. This book, like other Showcase Presents volumes, is jammed pack with comics, which often makes them a challenge to review. Luckily, the Hex stories are of fairly even quality and nature. The writing is split between John Albano for the early chunk of the volume with Michael Fleisher handling most of the next 200 pages. Arnold Drake fills in a one issue gap in the middle. As modern readers, you probably know. Hex is one gross looking gringo. In this first story his face remains in shadow, and it seems it’s only his reputation that makes people fear him. When it is revealed, at the flick of a match – it was probably quite exciting to the readers of the 70s – a real ugly hero, far cry from those spandex joes in DCs other books. Beyond his features, Hex shows much of his character in that first story. While his origins remain a mystery for almost the entire collection (the slow reveal is one of the few continuing plot threads leading to the book’s climax) you can get a good measure of the man here in this very first story. He kills without mercy, when the situation demands it. He expects no kindness and delivers none to those incapable of it. When surprised by an act of compassion, he responds in kind – only to be rebutted once again due to his appearance. His final act of gruff dismissal is for the object of his scorn’s own good – they want to follow him in his road, and he believes that his life is one no man should be forced to lead, no matter how exciting it must seem. Along with the classic action, there’s also an element of mystery, some spookiness that seems to follow Hex. Those that fear him believe him to be a ghost or a monster, and playing on this is probably what resulted in the change of the publications title from “All-Star” to “Weird Western Tales”. Of course, while Hex’s reputation is played up for drama, not much is truly the stuff of horror stories here. Hex is the classic anti-hero, a staple of the Western genre, that dirty jerk we just know is the best of ’em all. Believe me, he is – whether it’s gunning down a room of blood thirsty murderers, or wrestling down a man while one stabbed arm hangs limply at his side, Hex is going to come out on top. Well, most of the time. Any hero has to go through his share of tension raising near misses and character building tragedy. Amongst all the hootin’ hollarin’ and gunplay, there are some subtle aspects to this work, signs of Hex’s depth of character that survive to this day – reasons why he’s still in print when so many other Western heroes have been forgotten. The basic intrigue is easy – does he really value money more than human life? Is he a racist confederate soldier or one of the few gents out west that thinks more highly of the indigenous people than the white men taking their land? He’s the good guy in a relatively modern comic, so these questions probably have the answers you’d expect. But there are moments that seem to show his bravado might really hint at something else – does he let a grieving kid take a shot at him because he’s confident the kid would miss? Or are there reasons his own life has little value to him? Maybe being shot down by this boy fits with Jonah’s idea of justice. Wondering about his motivations, looking for the glimmers of the hero we know is there, and cheering him on when they present themselves – that keeps the pages turning. Of course, it would be extremely unfair to say that the story is the only thing that moves the book along. The art explodes out of the panels, with rugged men (and women) throwing punches, staging ambushes, and firing a gun just about once a page on average. That’s usually accompanied by some poor clod’s dynamic fall of death. I think Tony DeZuniga is my personal favorite artist featured in the Jonah Hex stories, but I never felt like any one illustrator was the bad one of the bunch. A variety of characters populate Hex’s wildwest, with all the facial hair, grit, and riding worn apparel you’d expect. Due to their often short lifespan, not many of them are particularly memorable, but while their motivations and actions were often similar, I didn’t feel like there were any cookie cutter cowboys here. I tried to scan a lot of art for this review, since I believe it speaks quite well for itself. While there were moments where I wondered about the color (I guess I’ll see what it’s supposed to be like in the next book), I was very happy to see the clearly inked pages. Every so often there was a little grayscale thrown in, but for the most part the hatching and dark blacks was enough to define the action. In fact, there are many times where I am thankful for a Showcase’s ability to really feature quality linework and inking. The last section of the book is a bit more mixed in quality. These are actually reprints of earlier issues, so maybe the creative teams hadn’t quite found their legs yet. Robert Kanigher handles the first four Outlaw stories, but the characterization is a bit clunky and forced. Since we’re back with John Albano, it’s not so bad, but again this is before he really hit his stride with Hex, so it’s not particularly memorable work. In end, there’s a tiny little bonus in the form of a seven page story headed by Gil Kane, which is notable only for being the only one in the entire book that actually seems to have elements of the paranormal. All in all, I could have done without all the “bonus material” in exchange for more Jonah Hex, but this book is very much worth the cover price just for what is contained here. If they ever get around to releasing Vol. 2, now that would go a long way towards earning my forgiveness. 4 out of 5. The Jonah Hex stories are really great. Solid fun with more depth than I expected, not that it will distract you from all the action. Unfortunately, the last hundred pages just aren’t Jonah Hex. That’s enough to drop it down a star. I’ve been told that one of the strengths of a Jonah Hex book is that you can pick it up without worrying about a convoluted history, but if you’re looking for the original material for this character, it’s in this volume. You don’t have to read anything first to enjoy this book. You could leap into the rest of Jonah Hex, including his modern ongoing. Finally, you might want to check out Showcase Presents: Bat Lash for other DC western material from this era. All of the western books are right near the start of our master list for the DC reading order. Absolutely. There’s such a pull to characters like that. While I still love me some Superman, Batman is probably more popular because for the same reasons. Ditto Wolverine. Perhaps it’s more moving to see their best moments when we’re also aware of their worst. I think I mentioned before that I was torn between this volume and Welcome to Paradise; if I had to pick one at this point I think I’d pick the Showcase Presents, but honestly I think I’ll get them both…this one for the “completist” in me and the other to see some of the stories in color and to read some later issues. Hopefully my reviews can help a little with guessing the readability. I’ll be hitting a lot of showcase volumes once we get into the silver age, at any rate. Might be a bit though, haha. I hear ya. And yeah, good luck keeping up the pace of a review a day once you get into the Showcases! You’ll need it…either that, or drugs to keep you awake 24/7. I actually think DC’s art style actually stayed “cleaner” a lot longer than Marvel’s did though, so I don’t think you’ll run into too many problems. And there are a lot less 1970s Showcases than there are 1970s Essentials (although some of Marvel’s 1970s horror books actually do look really good in black and white). It’s mostly the 1980s and ’90s Marvel comics that look awful in B&W, and there aren’t too many Showcases like that. The only ones I can think of are Booster Gold and Batman & The Outsiders, both of which look pretty damn good. hahaha I knowwww, it’s gonna be a slog at times. I’m really going to have to alternate between 80s and 90s trades I’ve already read and the showcase books I’m working through. I’ve read a lot of the non-showcase stuff from the 60s, 70s, and 80s, though, so that should make it a bit easier. It’s true, DC seems to mostly reserve their phonebook format for 60s stuff, though I’m hoping we’ll see a lot more early 80s strangeness collected in some form. I do have a couple Essentials I’d like to get into at some point, but since they’re not really on my to do list and look kind of hard to fit in, I’m not sure when I’ll be able to. I’ve got Ghost Rider and Moon Knight, I think. I have the first Essential Moon Knight trade and the art in it looks great, although I haven’t read the whole thing yet. Part of that, I think, is because a bunch of the stories in the middle were originally published in Hulk! Magazine, which was black and white. I have the first two Ghost Rider volumes as well, and while they’re readable, there are definitely points when you can tell that color would enhance the story. ah yeah, I think I heard that. I didn’t even know about Hulk Magazine until this year, when I was researching for the Marvel section of this site. Interesting – “magazine” probably to get around comic code restrictions, right? I did not write the above thing that starts “My spouse and I…” there must be some site glitch. It an awesome article Review: Showcase Presents: Jonah Hex | Trade Reading Order in favor of all the web users; they will obtain benefit from it I am sure. You don’t want the bicycle falling down onto the hood of your new car. the most important thing is to ensure that it is weather resistant because the bikes are usually left out in the elements.